So despite the best efforts of the Association of Dietitians of South Africa, the Health Professions Council of SA (HPCSA) and various eminent medical academics, the Banting Revolution continues to gain traction across the length and breadth of South Africa and across all ethnic groups, although it has yet to penetrate to working class communities to any great extent. But as I relate, that is also set to change sometime in the future. The reason for the phenomenal success of the Banting Revolution in South Africa is not difficult to explain – this dietary advice works because it is the only eating plan that is based exclusively on our real human biology and our real evolutionary history. It is also the only “diet” that allows subjects to (subconsciously) reduce their calorie consumption, thereby losing weight, without experiencing hunger. The mechanisms for this effect remain uncertain but are likely due to removal of the hunger-stimulating effect of high carbohydrate diets. Carbohydrates, it turns out, do not satiate; they stimulate hunger (as subjects adopting the Banting diet will gleefully inform anyone who asks). The Banting diet is also the oldest effective dietary intervention endorsed by the medical profession. Following Banting’s original 1862 monograph and in 1870 that of Dr Wilhelm Ebstein (the German cardiologist who took Banting’s diet to Germany and who is eponymously remembered for his description of Ebstein’s anomaly – the correction of which abnormality was pioneered by UCT’s Professor Christiaan Barnard in 1963 – another unusual Cape Town connection), it became the main diet proposed for the management of obesity by Sir William Osler in his iconic 1892 edition of The Principles and Practices of Medicine. Since the Banting diet is the oldest medically-endorsed diet for the management of obesity (and insulin resistance), those who refer to it as a “fad diet” simply expose their ignorance of the nutritional sciences. Instead the real “fad diet” is that which came into being in 1977 at the behest of the United States Department of Agriculture (USDA). Perhaps the longevity and global popularity of this proper fad diet, which promotes the ingestion of 6-11 servings of cereals and grains each day, has something to do with the fact that the USDA is an organization authorized to promote the sale of US agricultural products (not necessarily to look after Americans’ and the world’s physical health) and that the US is the largest exporter in the world of both grains ($9 billion/year) and so-called vegetable oils (actually chemically-processed seed oils containing omega-6 polyunsaturated fats and trans fats). It would take government-funded US scientists of the greatest bravery and integrity to suggest that perhaps the goal of these US government dietary guidelines is really to serve US economic interests (in the guise of improving the world’s health which they have clearly not done). To date not too many are prepared to state this publicly although the increasing realization that grains containing gluten cause a range of other medical conditions in addition to celiac disease is beginning to be acknowledged by some mavericks in US medicine (and elsewhere). The idea that gluten is one cause of the “leaky gut” syndrome which some argue is the basis for all auto-immune diseases and that coronary atherosclerosis is one such auto-immune disease, is slowly gaining a medical following. So what has happened in the past year since the publication of the original story of my medical epiphany a year ago in this journal? Our book Real Meal Revolution (RMR) and its Afrikaans translation, Die Kos Revolusie, have sold in excess of 175 000 copies. RMR has became the biggest selling eBook in South African history and was Nielsen’s choice as South African Booksellers’ Book of the Year in 2014, in part because it provided an economic windfall for an embattled industry. RMR has since been released in the UK and Australasia, as an imprint of Little, Brown and Company. The publication rights for Dutch and German editions have also been sold. Interestingly no money has been spent on advertising these books – they have sold so well because of word-of-mouth testimonies from satisfied converts. Perhaps there is an important message here. Despite being on sale for more than 20 months, the RMR continues to be near the top of the weekly South African books best-sellers list. I am told this has happened seldom if ever in the history of the SA book trade. The point is that what the book describes can no longer be dismissed by colleagues as a “fad”. The book has produced a fundamental change in the way many South Africans view food. They no longer accept without question, the traditional nutritional advice they have been given for the past 40 years and which has clearly not worked for the majority. RMR has also stimulated a unique phenomenon on social media in South Africa – Facebook pages devoted purely to the Banting diet and attracting hundreds of thousands of followers. Anyone uncertain of the extent of the Banting revolution in South Africa needs simply to track this phenomenon which has been termed The Wisdom of the Crowds. Our follow-up book Raising Superheroes which promotes low carbohydrate, real food eating for children, written over the course of the past 12 months with co-authors chef Jonno Proudfoot and UCT-trained, board certified paediatric dietitian Bridget Surtees (daughter of one of my favourite UCT teachers in the 1970s, paediatrician Professor Vincent Harrison), has been released. It too will be published in the UK by Little, Brown and Company in 2016. The opening exchanges in the HPCSA hearing brought against me by Sandton dietitian Claire Julsing-Strydom MSc, who is also the current President of the Association of Dietitians of South Africa, took place in early June. At issue is whether I am guilty of giving “unconventional advice” on social media by promoting the weaning of infants onto real foods (as opposed to processed baby foods rich in carbohydrates and added sugar). The scientific basis for this is fully argued in Raising Superheroes that becomes the “co-accused” in the case. The initial hearing was terminated within hours and postponed until November as the HPCSA had constituted the hearing committee in contravention of its own rules and regulations. Whilst we have been promised that this has since been corrected, there are still questions of the manner in which the preliminary hearing, of which we had no knowledge, was conducted and whether this too contravened HPCSA regulations. I am hopeful that this too can be resolved and the hearing continues as planned. As much as my views are on trial, the hearing presents a convenient opportunity to examine the scientific basis on which the current teaching in Nutrition and Dietetics both in South Africa and globally is based. As I argue here and elsewhere, the evidence appears crystal clear to me: It is those erroneous teachings that are the direct cause of the obesity and diabetes epidemics both in South Africa and globally. Until we interrogate the validity of those teachings, we cannot begin to reverse these epidemics. During the past year there have been a number of other interesting developments that bear directly on the Banting phenomenon. First Nina Teicholz’s book The Big Fat Surprise: Why butter, meat and cheese belong in a healthy diet was published and has received widespread acclaim in both the lay and scientific media. The book reviews in exhaustive detail all the scientific studies supposedly supporting the low fat movement (based on Ancel Keys’ erroneous diet-heart hypothesis) that began after the 1950s with the demonization of dietary fat. According to Richard Smith, former editor of the BMJ, the book “forensically destroys” the theory that the promotion of a high carbohydrate low fat diet is based on anything other than a manufactured science. Smith continues: “The title, the subtitle, and the cover of the book are all demeaning, but the forensic demolition of the hypothesis that saturated fat is the cause of cardiovascular disease is impressive. Indeed, the book is deeply disturbing in showing how overenthusiastic scientists, poor science, massive conflicts of interest, and politically driven policy makers can make deeply damaging mistakes. Over 40 years I’ve come to recognize what I might have known from the beginning that science is a human activity with the error, self deception, grandiosity, bias, self interest, cruelty, fraud, and theft that is inherent in all human activities (together with some saintliness), but this book shook me” (my added emphasis). I frequently state that all medical practitioners and dietitians need to read this book to understand what is and what is not known about the relationship between heart disease and fat in the diet. If we got this idea so completely wrong, what other nutritional untruths have we been sold in the course of our medical education? And which dietary fables do we continue to promote? 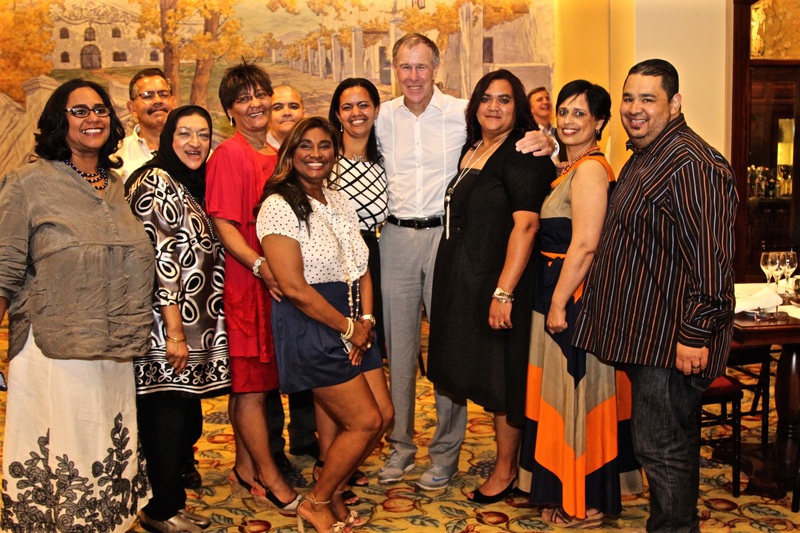 We held perhaps the “best-ever” low carbohydrate conference – The Old Mutual Health Summit – in Cape Town in February. We attracted most of the world leading low carbohydrate researchers and educators including key global opinion leaders in the field including Gary Taubes, Dr Eric Westman MD, Dr Steven Phinney MD, Dr Aseem Malhotra MD, Dr Jason Fung MD, Dr Zoe Harcombe PhD, Dr Andreas Eenfeldt MD, Dr Michael Eades MD, Dr Jay Wortman MD, Dr Robert Cywes MD, Dr Gary Fettke MD, Jimmy Moore and Christine Cronau. Surprisingly we were unable to find even one of South Africa’s most vocal opponents of Banting to explain to these international authorities why they are all wrong and why the diet they promote is so dangerous for everyone. The audience was left in no doubt that there is a very strong scientific base on which to prescribe the low carbohydrate diet especially for those with more marked insulin resistance, most especially those with obesity and diabetes of both forms. A number of recent publications have, like The Big Fat Surprise, further destroyed the previously unassailable authority of the “healthy” low fat high carbohydrate diet. Thus a new meta-analysis reports that dietary cholesterol has no role in determining the blood cholesterol concentration (1) whilst another again confirms that dietary saturated fat is unrelated to cardiovascular disease risk (2). If dietary fat is unrelated to cardiovascular disease risk, then the diet-heart hypothesis is false. If the diet-heart hypothesis is false, then the lipid hypothesis (cholesterol causes heart disease) is also likely untrue. Instead it is the trans fats – those that were placed into the food chain by the manufacturers of seed (“vegetable”) oils and margarine – and which have been, and continue to be promoted as the healthy and safe alternative to saturated fats – that are the most unhealthy (3). One wonders if those who advise us to eat margarine and unhealthy omega-6 vegetable oils will ever acknowledge their woeful error. I have invested all the royalties I receive from the sale of the Real Meal Revolution and Raising Superheroes (plus related activities) into The Noakes Foundation (www.TheNoakesFoundation.org) with the goal of promoting research to reverse the obesity/diabetes epidemic. Our first funding support has been given to an educational project in the Ocean View, Cape Town community. The project is the passion of Cape Town actress and social activist Euodia Samson-Beardwood, (the daughter-in-law of retired UCT physiology professor, Cyril Beardwood). Euodia became a household South African name through her television role as Gawa in the 1990s series Tussen Duiwels. She is herself another who believes that the Banting eating plan gave her a new lease on life. The goal of the 6 week educational program overseen by Groote Schuur Hospital physician Dr Hassina Kajee, was to determine whether a group of 30 volunteers, members of an exercise fitness club in that community, could implement, sustain and show health benefits from adopting an affordable (R30/day) Banting diet. Although not a scientific study as there was no control group and participants were being observed, not monitored, all subjects were able to sustain the eating program and reported that the experience has been life changing. Simple dietary analysis found that participants were eating diets that are very high in sugar and refined carbohydrates. This diet had first been adopted after the community’s forced removal to Ocean View. Most told us that prior to their forced removals, they had been raised on diets of real foods by parents who understood the value of such foods. The overwhelming conclusion was that the program has great potential to improve the health and quality of lives of persons who live in similar conditions and who eat the same unhealthy modern industrial diet. We are now looking to raise the funding necessary to extend this educational program to more communities and, with ethical approval, to undertake a proper study of the health outcomes of persons in similar communities who adopt this eating plan. The Noakes Foundation has also raised sufficient money from an overseas donor to fund a study of the current biology of subjects who claim that they have reversed their T2DM following adoption of the Banting diet. These claims are important since they challenge our conventional paradigm that T2DM is an irreversible disease that can only become progressively worse with time (despite what we believe is optimum medical care). The goal of the study is to document the current metabolic state of a group of persons previously diagnosed with documented T2DM but who now claim that following adoption of the Banting diet, they no longer require to use glucose-lowering medications and have according to their understanding (and sometimes their doctors’ opinion) “reversed” their T2DM. Their data will be compared with those from a group of patients with T2DM who are receiving conventional medical care including the prescription of the usual high carbohydrate diet. A key measurement will be the effects of the Banting diet on liver glucose production in persons claiming to have reversed their T2DM, something that has yet to be reported in the literature. The importance of this measurement is that excessive liver glucose production as a result of unopposed glucagon activity – what I term, pancreatic alpha-cell insulin resistance – now appears to be the defining abnormality in T2DM (4). Remarkably former UCT and University of Stellenbosch Professor of Physiology Johan Koeslag was perhaps the first to propose this mechanism of pancreatic a-cell resistance to the action of insulin as the cause not just of T2DM but also the Metabolic Syndrome (5). But like all really innovative ideas, his theory was at least 14 years ahead of the rest of the world! I am sure that in his retirement Professor Koeslag will draw comfort from the knowledge that his theory is gaining traction in the science of T2DM. Insulin resistance in other tissues including skeletal muscle is NOT the key abnormality driving T2DM (6) so that attempts to improve peripheral (skeletal) muscle insulin resistance can never be the cure for T2DM. I invested the prize money I won with a particular scientific recognition to fund the MSc thesis of Mr Chris Webster at UCT into the effects of the low carbohydrate diet on liver glucose production in athletes who are either habitually adapted to high carbohydrate or high fat (Banting) diets. This is the first such study yet undertaken in the world. Chris found that liver glucose production (and blood glucose regulation) remains normal in athletes adapted to low carbohydrate diets, largely because they dramatically reduce glucose use by their glucose-dependent tissues. This contrasted with our prediction that eating a low carbohydrate diet must stimulate liver gluconeogenesis specifically to provide sufficient glucose for the survival of tissues like the brain. Instead the study found that eating a low carbohydrate diet (comprising 25-50 grams/day) provides sufficient carbohydrate to maintain normal rates of liver glycogenolysis even during exercise. The other finding was that athletes adapted to the high fat diet dramatically increased, two- to three-fold, their capacity to use fat as a fuel during more prolonged exercise. The obvious conclusion is that this capacity must be the usual human state and that the low rates of fat, and high rates of carbohydrate oxidation found in carbohydrate-adapted athletes must be the result of an acute adaptation to the more recent dietary change that has happened in the last 12 000 years or so of human history. Having proved that we can measure liver glucose production in healthy subjects accurately, we can now use the same technique to compare liver glucose production rates in those with supposedly-reversed T2DM and those with T2DM who continue to receive the traditional high carbohydrate dietary prescription. Our hypothesis is that liver glucose production will be lower (and presumably normal) in those claiming to have reversed their T2DM on the Banting diet. This could mean that they have restored the action of insulin on the glucagon-secreting pancreatic alpha cells. Does insulin resistance explain overweight/obesity in marathon runners despite high levels of habitual physical activity? Fat marathon runners (as I was) and overweight dietitians are the graphic expression that we don’t really understand what causes obesity. For if it is lack of exercise, then all marathon runners must be lean; if it is correctly following current dietary guidelines, then all dietitians must also be lean. We suspect that both groups are insulin resistant and that even though they train so much, fat marathon runners are still unable to utilize all the excess dietary carbohydrate which is instead stored as fat. With funding from the National Research Foundation, David Leith at UCT is studying this question in overweight male and female marathon runners to determine whether the solution for overweight marathon runners is not simply to try to run more, but rather to restrict their carbohydrate intakes. Growing realization that T2DM will bankrupt all medical services within the next 10-20 years. There is a growing realization that the increase in global diabetes rates are now out of control and will bankrupt most medical services around the world within the next 5-15 years. A recent report from the UK states that the incidence of diabetes has risen by 66% in the past decade; that management of the disease currently costs the NHS 10 billion pounds, 80% of which is spent on the management of avoidable complications. This cost is unsustainable and threatens to bankrupt the NHS within the next decade. Since diabetes is the leading cause of death in the Western Cape, one wonders how long it is until the same applies to our local medical services. The problem with T2DM is that whilst we argue that it should be a preventable lifestyle disease, yet we treat it as if it is an irreversible progressive disease with an inevitable outcome (peripheral gangrene, blindness, renal failure, dementia, cancer etc). As someone with T2DM, well managed on a Banting diet, regular exercise and medications (including highly effective “complimentary medicines”), I don’t believe this to be the case. My opinion is that T2DM is simply one of many manifestations – the others are obesity, hypertension, heart disease, gout, dementia and perhaps cancer – of an underlying condition – insulin resistance – that is controllable (note – not curable), not by prescribing ever more medications but by removal of the aggravating cause which is repetitive exposure to a high carbohydrate diet (in those who are markedly insulin resistant). For what we certainly now know is that the continual exposure to insulin either in persons with T1DM who (over)use insulin, or patient with T2DM who eats more than 25 grams of carbohydrate per day, produces progressively worsening IR requiring ever more insulin (in addition to other medications) until even maximal drug doses are no longer effective. It is this progressive worsening of insulin resistance in both forms of diabetes that ultimately produces the irreversible complications of both forms of this disease. It follows that the best way to prevent these complications is to prevent the progressive development of worsening insulin resistance. This can be achieved with the judicious use of medications and eating as few carbohydrates as possible. The challenge for all of us: Do we continue to sit on the fence? Or do we join the battle to reverse the global and South African diabetes/obesity epidemics? A question that I frequently ask myself is: What have I learned during my recent descent into quackery (as some thoughtful colleagues have suggested has been my fate in the past 5 years)? Probably my single most important realization is simply this: In former times humans feared the sudden arrival of infectious pandemics like the Plague or smallpox for we knew not what caused them and were powerless to prevent the millions of deaths that each caused. But the reality is that the deaths and financial ruin that we face in the next 10 years as a result of the obesity/diabetes pandemic will dwarf that caused by the Plague. But unlike the Plague we know exactly what is the cause of this pandemic. Yet we seem powerless to act on that information. And why is that? Again the answer is quite simple. Unlike the infectious pandemics that were not of our making, the obesity/diabetes pandemic is of our own making. We caused it. Those doctors, medical scientists and dietitians who like I did, prescribe and continue to promote the failed 1977 USDA guidelines are the direct cause of the pandemic. And until we collectively accept our guilt and own up to our profound error, we will take our peoples further into the diabetes/obesity abyss. We cannot forever place the blame elsewhere – at the feet of Ancel Keys PhD, Senator George McGovern and the US government (7) – or on our patients (whom we argue simply fail to comply with our advice). We have to be fearless. We have to take the burden of our guilt onto our own shoulders. I began that process now 5 years ago and am certain that it will be the most important contribution I will ever make to my profession. All we need is more colleagues to see the light and to join our fight back to the truth. Once we have accepted responsibility for our part in this disaster, we need to acknowledge that the most common medical condition globally is not a “chronic disease of lifestyle”. It is the underlying biological state – insulin resistance – exacerbated by habitual high carbohydrate intakes that is the basis for these diseases of “lifestyle”. Once we understand and acknowledge this nutritional/biological basis for these diseases, we can begin to reverse the epidemic of these “chronic diseases of lifestyle”. But to do this we need also to insure one additional change. We need to regain the intellectual independence of our teaching institutions. If there is more than one plausible explanation for a particular disease, which one is likely to be taught in our medical institutions? Take for example coronary heart disease. I read that there are four plausible hypotheses – the cholesterol, insulin, infection and auto-immune hypotheses – for the development of coronary heart disease. Yet the medical students I speak with across the country, inform me that they are only ever exposed to one – the cholesterol hypothesis – and have never heard of the insulin hypothesis (8) which in my opinion is based on a much more secure body of knowledge (7). How has this happened? The answer could be that through its influence at many levels the pharmaceutical industry subtly directs what is taught to medical students. The bias will be to promote the use of its own products in preference to other non-pharmacological interventions, nutrition, or exercise, for example. For the future health of the profession we need to insure that what we teach is truly independent of all these external influences. The obesity/diabetes epidemic is the greatest challenge medicine has ever faced in its long history. I argue that our profession is the (perhaps unwitting) cause of the problem. We can either pretend it’s someone else’s problem. Or as a profession we can to do what is necessary to bring about its end. The global Banting Revolution has its origins in Cape Town. Would it not be remarkable if the Western Cape doctors who read this article were to be the first in the world to act collectively against the real cause of the obesity/diabetes epidemic? These are big issues. Our profession holds a unique position of responsibility in our society. We can no longer continue to fail our society on this one topic because we are too scared to own up to our own, sometimes, failings. Berger S, Raman G, Vishwanathan R, Jacques PF, Johnson Dietary cholesterol and cardiovascular disease: a systematic review and meta-analysis. Am J Clin Nutr 2015; 102: 276-294. De Souza RJ, Mente A, Maroleanu A, Cozma AI, Ha V et al. Intake of saturated and trans unsaturated fatty acids and risk of all cause mortality, cardiovascular disease, and type 2 diabetes: systematic review and meta-analysis of observational studies. BMJ 2015;351:h3978. Unger RH, Cherrington AD. Glucagonocentric restructuring of diabetes: a pathophysiologic and therapeutic makeover. J Clin Invest. 2012;122(1):4-12. Koeslag JH, Saunders PT, Terblanche A reappraisal of the blood glucose homeostat which comprehensively explains the type 2 diabetes mellitus-syndrome X complex. J Physiol. 2003; 1;549(Pt 2):333-46. Rizza R. Pathogenesis of Fasting and Postprandial Hyperglycaemia in Type 2 Diabetes. Diabetes 2010; 59: 2697-2707. Noakes TD. The 2012 University of Cape Town Faculty of Health Sciences centenary debate: “Cholesterol is not an important risk factor for heart disease, and the current dietary recommendations do more harm than good”. S Afr J Clin Nutr 2015;28:19-33.